Specifically designed to provide a permanent or non-permanent lifting or anchor point for attachment to universal beams and girders. Suitable to fit an extensive range of beams and RSJ girders from 75mm up to 230mm flange width. For improved safety the threaded adjustment screws are each secured by a recessed allen head screw which in turn locks the adjustment bar in position with a copper flat. 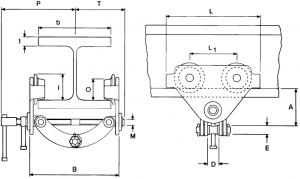 Damage or stress to the flange is avoided by the unique jaw design which transfers the load away from the edge of the flange. Reduced head room is achieved with the integrated load bar. Rugged all steel construction for reliability and long service life. Finished in custom black enamel. Each PRO-3G Girder Clamp has an individual serial number on the identification plate as well as stamped on the side of the clamp. A Test Certificate is supplied with each clamp showing all relevant details for tracing and test reference to the manufacturer. Factory tested and loaded to 150% of the rated capacity before shipping. A strong, lightweight professional working tool that weighs just 2.13kg and can easily be carried on a work belt or in a backpack. Suitable for pulling, lifting, tensioning, positioning and most lashing applications. All steel construction with impact resistant gear case cover. Fitted with an automatic Weston brake, weather protected for reliable service. Chain is Grade 80 with corrosion resistant electro galvanised finish. Standard lift is 1 metre. Gear system is freewheeling type. The top and bottom hooks swivel on roller bearings. Secure safety catches fitted to both hooks. Each PRO-3G Compact Lever Block is factory tested to 125% of the rated capacity. Individual serial number is stamped on the identification plate for service reference. A safe and secure attachment point to overhead girders that provides easy movement along the girder when repositioning is required. Suitable for mounting most types of electric hoists, chain and lever blocks or other related equipment. 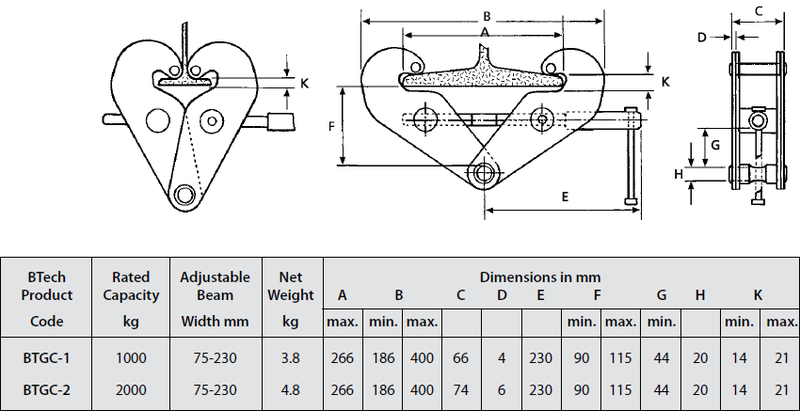 Designed to operate on a variety of beam types (RSJ, UB and WC). Anti-derailment end plates incorporated into the design for additional safety. Trolley wheels incorporate pre-greased roller bearings for easy movement. 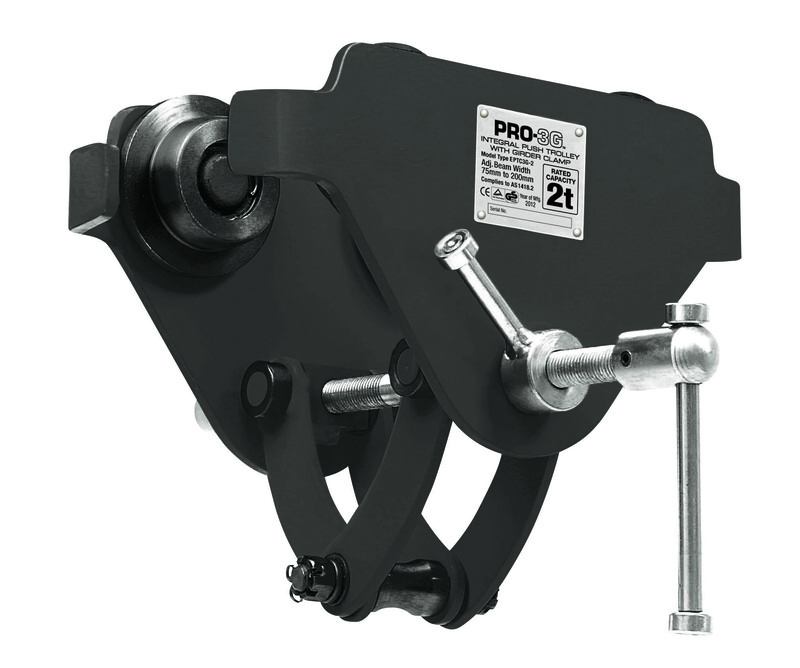 Fully adjustable to fit a wide range of flange widths from 75 to 200mm. Integrated load bar for reduced headroom. Zinc plated threaded spindle mechanism for long term corrosion protection. Custom finished in black enamel. The easy-lock lever secures the spindle against the side plate preventing any movement along the beam. 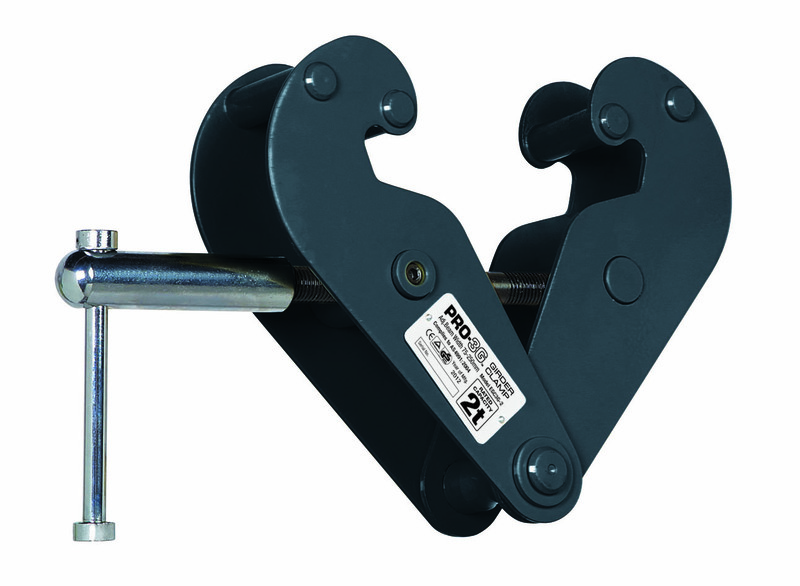 All PRO-3G Integral Push Trolley & Girder Clamps are stamped with an individual serial number and are supplied with a Test Certificate that relates to that number. Factory tested to 150% of the rated capacity with results shown on the Test Certificate. A reliable, quality chain hoist to suit most applications for lifting and stage rigging with the added security of overload protection. Patent Pending unique overload feature ensures protection for the operator from serious injury and possible damage to the structure if the load exceeds the hoists’ capacity. The unique design allows the load to be lowered easily in the event of an overload occurring. All steel construction with an enclosed gear box and mechanism for long life and durability. Weather protected Weston brake complete with asbestos free brake discs. The braking system includes two brake pawls engineered and positioned for additional safety. Hand chain has corrosion resistant Zinc dichromate (Gold) finish. Stainless steel identification plate secured with brass rivets. The load chain end stop design helps ensure load integrity. Thrust roller bearings are fitted to the bottom hook to allow the load to swivel smoothly and easily when under load (as per Australian standard requirements). Both hooks are fitted with cast steel safety latches. Each hoist has an individual, traceable serial number and is supplied with a Test Certificate. Chain bags to suit various lift heights available. Extra lift heights for load chain and hand chain are available on request.